Announcement Home of the Cowboy Campfire Coffee Break! Our grandson's picture dressed as a cowboy inspired me to create a pattern that includes a campfire, and directions full size patterns for making a "bacon/steak platter and plates. If you have an extensive stash of fabrics, that is probably all you need. Grandmothers/Others who enjoy tea parties, and can sew can make birthday or Christmas gifts to suit the intersts of those special to them. Best of all, there are two sizes for use it constructing a fabric campfire! :) The pattern for campfire has my permission to copy for rug hooked version. New! 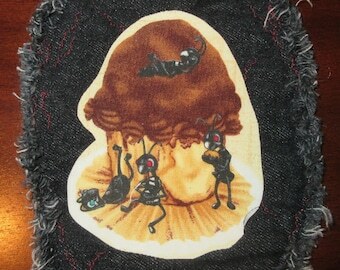 areas are renamed, Rug Hooking patterns may be used for collage purposes, for those who are familiar with the techniques. I am not providing directions on how to, as there are beau coux videos on YouTube to show you that. In the collage category look for Food items to personalize CCCB(see above), as well as other small "easter eggs" prepared to be ready for placement. Backings will vary, but in general much of it will be on Steam 2 Steam. Welcome to my ETSY Shop! Cotton Eyed Jo is a TX Upcycler who does needle and fiber arts.Upcycling is the artistic cousin of recycling. Sports jackets for rug hooking ~ beaded dresses~ vintage textiles ~ turning tattered discards into new art with a whimsical twist is MY style. Be sure to check out the items from my other team, EtsyFOLK. Our team is global and very eclectic. We put a modern twist to the idea of folk art! Search teametsyfolk to see many of our listings. Home of the Cowboy Campfire Coffee Break! 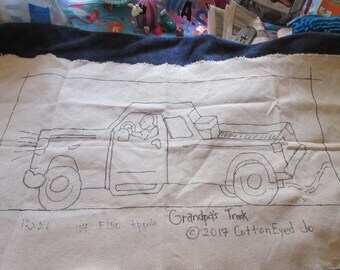 Our grandson's picture dressed as a cowboy inspired me to create a pattern that includes a campfire, and directions full size patterns for making a "bacon/steak platter and plates. If you have an extensive stash of fabrics, that is probably all you need. Cowboy Campfire Coffee Break Christmas Tea Play Set Free Shipping! 10” x 11” Texas Hold Em FREE SHIPPING table mat for imaginative play. Beautifully handcrafted rug. Great colors. Just love it. Very sweet quilted heart! Love it!! Quick shipping.. highly recommend this seller!! I have been trying to find this pattern for awhile. Thanks. No returns accepted. High value items will be insured, but if severely damaged may not be able to be repaired or replaced. Returned checks will have a $25.00 fee. Generally within 48 hours of cleared payment, so long as the USPS is open. At peak times for mail, shipping may take longer for them to process. I'll get it to the USPS asap, after that, I have no control over the transit time. Personalized items will take awhile to personalize. Shipping will generally happen within 7 days, starting at the end of convos to determine what you are wanting to receive. If you haven't received an convo from me, don't hesitate to send me one. If your directions are simple, place a note in purchase! I will generally try to contact you for approval prior to fusing or sewing down foods. Cowboy Campfire Coffee Break Play sets are designed with Toddlers or older kids in mind, (3 - 99) They are basically small quilts and are designed to be machine washable and or dry able. They should be examined after rewashing for loose threads, or torn seams. Supervision of use is recommended. Hooked Rugs should NOT be put into a washing machine. If surface soiling occurs it should be blotted up immediately with a clean cloth. Most of my hooked items are for decorative purposes, to be hung or placed on a table. Many of the items I create are NOT CHILD SAFE Materials will be in the listing or tags, and might actually be dangerous to a young or unsupervised child. The chicken wire wings on the Dragonfly makedo would not be appropriate as a gift or decoration for a child's room. Items that contain parts such as rusty springs also pose possible dangers that should be obvious because of the part.